It started out as a real-life fairy tale. Boy meets girl. Girl meets boy. They stare at each other from across a crowded room and knew with all certainty they were "the one." With their hearts beating heavily, they fall in love at first sight, and ride off into the sunset together. Well, almost. How we reconnected in a powerful rekindled romance that would seem to appear only in movies and romance novels. One always wonders about the one that got away. After seven years together with the man I referred to as the "Love of my Life," we went our separate ways and married others, just days apart. I thought I'd never hear from him again. One year ago, shortly after Valentine's Day and 16 years after our split, my long lost love contacted me out of the blue on Facebook. He had recently gotten divorced and had kept an eye on me digitally through my blog at CyberDatingExpert.com and on Facebook, but I had no idea. He actually had sent an email to me a few years earlier on Facebook, but it went to the "other inbox" intended for spammers and I never saw it. It's just as well, as we weren't ready to meet again just yet. After his marriage ended and without my knowledge, he had ordered a copy of my online dating book, The Perils of Cyber-Dating, thinking he could use some help in the dating advice department. He was a bit curious to see what I had written. Little did he know, the book was filled with stories about him and our romantic journey, as well as our tearful break up. It caught him completely off-guard and it took him weeks to finish reading about our fairy tale romance, which I ended when it appeared it had run its course. I had no idea that my book which helped heal my heart, and those of others when our relationship was over, would suddenly bring us back together again a decade and a half later. Was I ready for this? Just two months after my book was first released in 2009, I stopped by Deborah Norville's book signing for Thank You Power: Making the Science of Gratitude Work for You (Thomas Nelson) at the National Association of Broadcasters Conference (NAB) in Las Vegas. Norville and I talked about books, while she knitted away, one of her favorite past times. I mentioned that I was an author. She asked me about my book, but stopped me in mid-conversation and said, "Tell me there's a happy ending. I only want to hear about the happy ending." The problem was, there wasn't an unhappy ending. I had a lot of happy stories, but the "ride into the sunset" Hollywood ending did not appear in the last chapter of my book. I figured I could write a sequel one day with a happy ending that Norville and the rest of the world really wanted to see. At the time I met Norville in Las Vegas, I was divorced and busy coaching singles, instead of spending time on my own love life. Flash forward seven years, it's now 2016 and my love life has come full circle, as I reunited with my long-lost love. It's a story that could appear in a romance novel or a romantic comedy, but it was happening in real life for us. 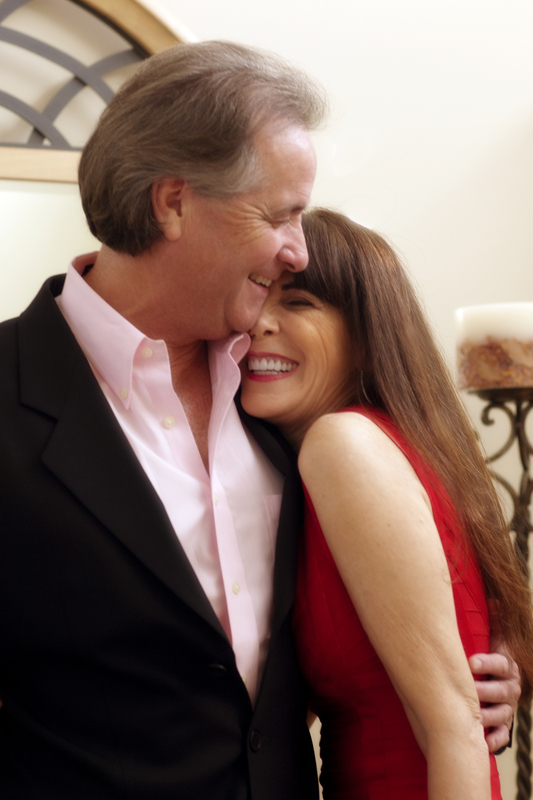 "We have a great love story," the love of my life said, as he enthusiastically met all of my girlfriends for the first time at my birthday luncheon a few months ago. Indeed we do. The love of my life returned to me for Act Three and another chance at love. Rekindled romances. They're quite popular, but I didn't see this one coming. In the Lost Love Project headed by Dr. Nancy Kalish from California State University in Sacramento, she surveyed 1,001 participants aged 18-89 who reunited with an ex-boyfriend or ex-girlfriend after five or more years apart. Dr. Kalish's survey found that 72 percent of couples stayed together, with two-thirds resulting in marriage or engagement. Her survey results were published in Lost & Found Lovers: Facts and Fantasies of Rekindled Romances. On Kalish's blog, she states that those who cannot forget a lost love interest and seek to meet them again, often results in a long-lasting and meaningful relationship. When the love of my life and I reunited for the first time after 16 years apart, we were both a bit nervous. A lot had happened in over a decade and a half; too much to share in one meeting. We both wondered if the chemistry would still be there, or if it would be a one-time only conversation to go down memory lane and continue on our separate paths. When he arrived, our eyes met and instantly locked in a similar way as the day we met for the first time 23 years earlier. We hugged, we smiled, and we connected. We were older, wiser, but had too much history not to feel a spark. There were so many questions I wanted him to answer, but I also wanted to enjoy the moment together. We stared at beautiful the Pacific Ocean at a place he had wanted to meet me at two years earlier. The years of history flooded my head and my mind wondered if I should open my heart, or keep this book slammed shut. It felt like we could pick up where we left off, but how does one do that without getting hurt? He was greyer and I was thinner. We both had similar life lessons, but we never stopped loving each other. That's all that mattered. Both of us knew there would always be a connection, but weren't sure if we should rekindle our romance. I didn't want to be his transition person. We both wondered if we'd have a fateful ending, or was the familiarity and deep love that we once had enough to start all over again. Neither of us had the answer on our first meeting, but we were open to the possibilities. He sent me a text on his way home, which said, "I should have kissed you hard." I replied with, "Another regret?" He quickly replied with. "No, there's still time." We communicated for a few months before we decided to take the plunge. We decided to live Act Three of our story, together, our best and final act. We posted photos of us on Facebook, which instantly received "likes" from friends who knew us then, and those who know us now. Together, we wrote the epilogue to my book, The Perils of Cyber-Dating, which I narrated and was just released in time for Valentine's Day. It will be a Happy Valentine's Day indeed. Listen to the book trailer for The Perils of Cyber-Dating: Confessions of a Hopeful Romantic Looking for Love Online. Julie Spira is America's Top Online Dating Expert and Digital Matchmaker. She's been helping singles find love online for over 20 years and is the founder of Cyber-Dating Expert. Download a free copy of The 7 Secrets to Finding Love Online and sign up for the free Weekly Flirt.